You will find some people at Downcity Church in business casual attire, some dressed casually, and some more formally dressed. We are located right in the heart of Kennedy Plaza in downtown Providence. 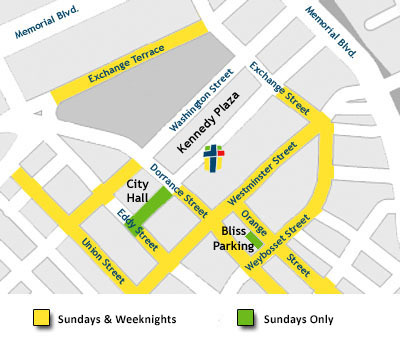 On-street parking is free on Sundays and is available near us on Westminster, Dorrance, Eddy, Washington, Orange, Weybosset, and Union Streets as well as Exchange Terrace. Additional parking is also available on Fulton Street next to City Hall and at Bliss Parking at the corner of Weybosset and Orange Streets. Downcity Church is located at 68 Kennedy Plaza between CVS and the Bank of America building. Entering the front door, take either the elevator in front of you or the stairs to your right to the third floor. Our praise time usually includes 6-8 songs, corporate prayer, and Communion. The corporate worship is led by one vocalist accompanied by keyboard. Lyrics to the songs are projected and also printed in the weekly program. The preaching time lasts anywhere from 30-60 minutes. Pastor Ted is currently preaching a series called Romans: The Gospel Explained and Applied. After the service most people stick around for awhile to catch up with one another. We’d love to get a chance to say hi! Yes, we do provide nursery care on Sunday mornings for children under three years of age.